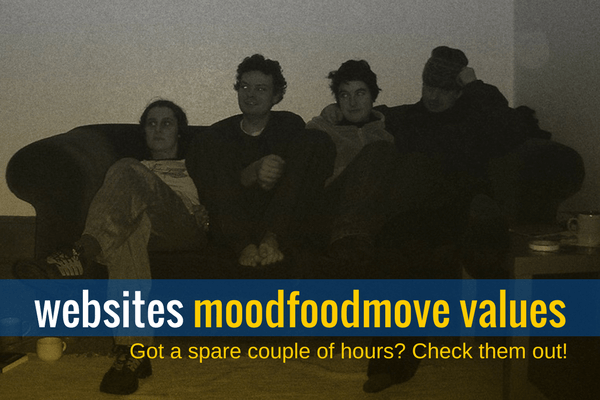 I am sharing with you a list of websites moodfoodmove values. 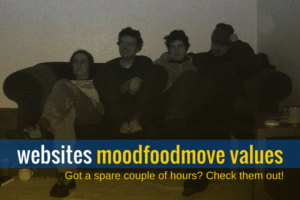 Moodfoodmove has a soft spot for people affected my mental health issues – especially depression and addiction. These resources have been collected with these lovely folk in mind. For the aforementioned mental-healthers I strongly believe in learning as much as you can about good mental health. By doing this you can identify your own unique health idiosyncrasies, and see where you fit in the continuum. This means you’ll be more informed when you’re seeking the right type of professional help. Recovery involves self-knowledge and self-understanding. The better you understand your mental health the more compassionate you will be to your perceived flaws, and the more self-accepting you’ll become. That is a grand and honorable recovery goal to have. Empower yourself through knowledge. Psychology Today’s ‘depression’ pages – The more informed you are about depression the better you will understand how depression uniquely manifests itself in you. Psychology Today has some excellent contributors, writing from very different perspectives on the topic of depression. Window off an afternoon to spend looking over the articles. Therese Borchard – Therese is the founder of Project Beyond Blue, and is a writer and mental health activist. She writes about her own experiences of depression recovery and management in an intelligent and sensitive way. Therese has a vast archive of well-written blog posts and articles. She also writes for HuffPost and other media outlets. Students Against Depression – SAD offers workbooks, courses and factsheets for people wanting to move beyond their depression symptoms. All their material is validated by health professionals – which makes it safe, sound and reliable. The information they share is solid advice for any adult affected by depression. Sober Recovery – I truly love this site. Sober Recovery is an addiction recovery resource – with a very comprehensive range of topics covered. Their articles are wide-ranging, well-written, and informed. It’s home to an active forum community – who support, inform and debate addiction-related subjects. Spend an afternoon (or a week!) browsing. The Fix – This is the daily website for alcohol and drug addiction recovery news and information. The Fix is a respected source for addiction recovery resources, rehab reviews and sober living tips. Topics covered include the value of yoga, diet, ultra-marathons, AA meetings, learning, recovery memoirs… on recovery. The Fix’s range is deep and broad. Libero Network– I discovered these guys recently. The Libero Network support people recovering from addiction, depression, anxiety, self-harm, and eating disorders. Their site has an good collection of intelligent articles, and it encourages community involvement. A good place to start is their About page. Find them in Twitter and Facebook, too. Shrink Yourself – I’ve taken the 12-week online program, and I have the book – written by psychiatrist Dr Roger Gould. Shrink Yourself is a therapy process to help you overcome emotional eating habits. It concentrates on the psychology behind emotional eating, with very real practical advice. Have a look over the site, and blog – and see what you think. Am I Hungry? – This site is run by Dr Michelle May, and offers the Mindful Eating Program. It is a way to think about the small decisions you make every day that affect your eating, activity, and overall health. I haven’t taken it, but I follow Michelle on Twitter and am on her email list. I have a lot of respect for her approach to mindful eating.